“We create our own demons,” Tony Stark concludes in Iron Man 3. Very true, but subversion can only go so far. We also fight actual demons and overt villains. Subversion can only go so far. Once it was more clever to treat one villain as the real threat all along. 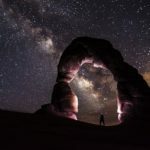 Now more storytellers like to pull out the floor out from under readers, not only to attempt creative plot twists, but to challenge readers’ perceptions of good and evil. 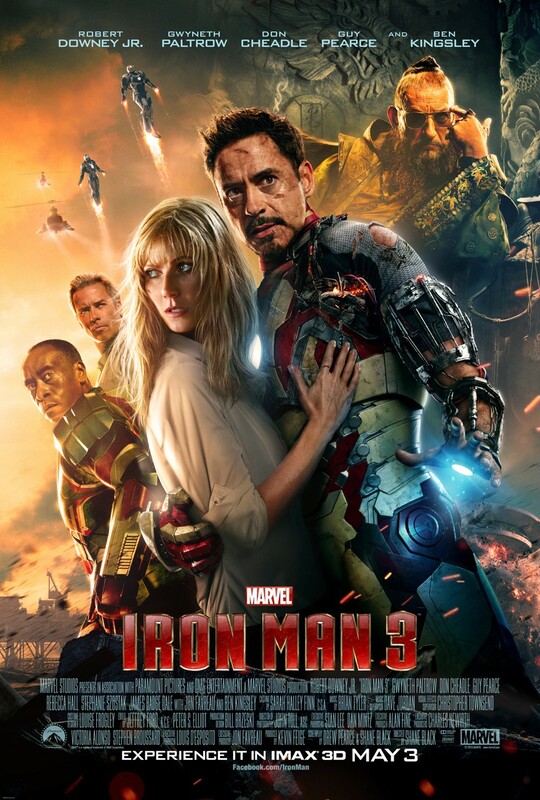 Our most recent example comes from the latest Marvel superhero actioner Iron Man 3. I understand this came as a shock to comics fans, but the filmmakers took the chance of showing that the story’s main villain — the villain promised in all the film’s teasers and posters and other marketing materials — was a false front all along. In some sense this was not a new idea; it was merely an extension of the first Iron Man film’s story that Tony Stark’s business partner had used foreign terrorism to bolster his own (admittedly vague) war-profiteering plans. But 3’s emphasis was more overt. Thus it was more subject to truth and potential lies at the same time. In the Star Wars films, Darth Vader isn’t the real villain. Surprise! It’s the Emperor. In the novel Ender’s Game, as recently noted, the ending is vague enough to suggest that the Buggers aren’t so bad. Surprise! The real villain might be … ourselves. “Everything we know about them is wrong.” So why assume otherwise about the giant kingpin dragon? 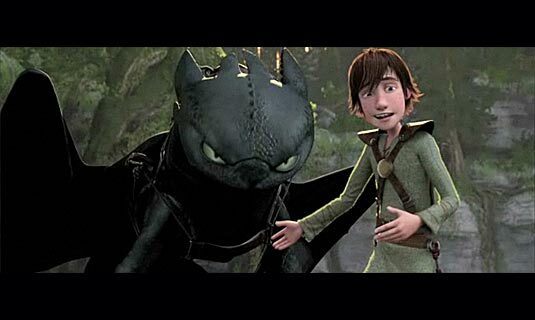 In the film How to Train Your Dragon, none of the cute dragons are the villains. Surprise! The real villain is a giant mountain-sized dragon who’s enslaved the others. In The Hunger Games trilogy, President Snow and The Capitol are not the real villain. Surprise! The real villain is human inclination toward repeated acts of tyranny. For another Marvel film, Captain America: The First Avenger, Col. Phillips specifically says in the trailer, “Your enemy — is not who you’d expect.” So the Star-Spangled Man won’t be punching the real-life Hitler? Surprise! The real villain is the Red Skull. Am I critiquing these surprise villains? Would I prefer only up-front villains such as Lord Voldemort, Sauron, The White Witch, Khan Noonien Singh, the Dominion, and Loki? Not at all. Under the surprise-villain trope lies powerful truth based on God’s Story. We might fear sinful corruption from cultural influences or what we take into our selves, but evil sneaks out from us, for it comes from our own sinful hearts (Mark 7). We might fear homosexual or “gay marriage” activists, but become actual bigots who reject opportunities to love people despite their sin and share the Gospel. We might fear Islamic terrorists, creeping Sharia law, and false “tolerance” that only leads to enabling real evil, but become hateful religious extremists ourselves. We might lambaste the secular media for ignoring or twisting facts, but fall into the sin of spreading our own rumors or plain lies about religious and political enemies. We might guard against something in red tights, or humans who overtly push the occult, forgetting that “Satan disguises himself as an angel of light” and that “his servants, also, disguise themselves as servants of righteousness” (2 Cor. 11: 14-15). I doubt many storytellers are trying to challenge core moral assumptions about evil. Often they are simply trying to be clever; often they succeed. But when one film’s surprise-villain describes his scheme and name-drops Osama bin Laden as an example of a false-front evil that lets him commit real evil behind the scenes, that can make the trope a half-truth. At the very least, such views end up ignoring moral truths that make a truly complex story. Evil does come from our hearts, but it is reflected in sinful culture. Christians might become bigots, but the homosexual agenda is also sinful. We might condemn all Muslims for the sins of some, yet Islamic terrorism is still evil and must be condemned. We might fault secular media and give Christian rumor mills a pass, but many journalists are still biased. And though Satan likes to disguise himself, sometimes he does kill people by daylight. Ultimately the surprise-villain trope is like a lot of things in culture: a mixture of profound and even Biblical truth, but often repeated to the point of losing its impact and complexity. Can our stories not show that yes, human nature is the real evil here, but the Devil or other foes are also evil and must be stopped? Can we specifically explore the fact that reactions to terrorism or villainy might be evil, but that we must still oppose the overt villainy? And perhaps most interestingly, when story heroes do discover the Surprise Villain, why on earth do they instinctively give him the final beatdown, after just showing sympathy to the false-front villain? How do they know that this one is merely a second false-front before yet another third-tier surprise-villain? How do they know the first false-front villain is not just extraordinarily clever and merely invented the “real villain” in the background to take the blame, while the first and supposedly false-front villain gets away with worse evils? How do they know the first false-front villain is not just extraordinarily clever and merely invented the “real villain” in the background to take the blame, while the first and supposedly false-front villain gets away with worse evils? That’s the most intriguing idea I’ve heard in a while. I should also point out that several of your examples of surprise villains come from works with multiple episodes/entries, so those cases are probably drawing more from the need to expand or develop the story. In some cases, like the Hunger Games trilogy, it’s simply being more realistic about the subject matter than simply having a person be the end-all villain. Still, I find that I like both strains of villain from a story perspective. 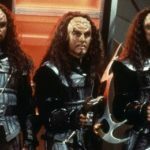 The up-front villain allows you to focus on the good guys a bit more, while the surprise villain allows for development of ideas of evil and plot twists. I’ll have to consider this some more. The awesome yet too-long-running TV series 24 took this trope to an extreme, playing bait-and-switch games of villain-behind-villain-behind-villain like a babushka entrancing the grandchildren with a set of Russian dolls. It was mind-blowing the first time, entertaining the second, and dully predictable the third. Like with any trope, familiarity breeds contempt. One of my beefs with Iron Man 3 is the fact that the big head-fake felt disappointing instead of astonishing. Yes, I understand that was probably part of the point: that the villains we ought truly fear often dwell much, much closer to home than those exotic Others conjured by our imaginative projections. But … but the Mandarin was so much cooler than the puppeteer pulling his strings! Also, I felt like I’d been abruptly catapulted into a remake of The Incredibles. Harry Knowles in his review insisted that he was certain the Mandarin was still the real villain all along, as in the comics, apparently (which some have condemned as a racist Asian caricature). He was convinced further film installments would prove that it was the false-front that itself was a false-front. This sounded like wishful thinking. I actually thought the Mandarin was pulling a Hans-Gruber-on-the-roof-of-Nakatomi-tower routine (“You’re one of them, aren’t you?”) for about half an hour after he got caught sipping a soda. This misapprehension only aggravated my eventual letdown. This is rather common in Doctor Who as well, though the success of the episode depends. One of the stronger ones, imo, is Amy’s Choice, with the mysterious Dream Lord who is testing Amy. His reveal actual shows us more about the main characters. Yeah, anime series have done this to death. There’s always a bigger fish, as long as the series can run. It’s fun in fiction sometimes, but if it happens too often, it gets predictable. I personally prefer one main villain, or an organization of them, for clarity’s sake. Every villain should have lots of shades of gray, of course–I love the idea that if the whole story was written from the antagonist’s Pov, the hero would be the villain. In they story I’m writing now, the villain helps the heroes more often than not–but he does it to further his agenda. It’s hard even to figure out if he’s the villain at all until the end, when his grand plan is revealed. Can anyone think of a story in which the Big Reveal is shown to be the power behind the power, and yet the secondary false-front villain is also just as evil? (Spoiler.) Immediately The Hunger Games part 3 comes to mind, but that’s it so far. The Memory, Sorrow, & Thorn series and the Shadowmarch series, both by Tad Williams. If you’ve read Iron Man: Extremis, it’s actually a double fakeout. In Extremis, the main villain behind everything is…Maya Hansen, who was the one who helped the main villain in IM3 leak the sample for her own ends. So rather than use the actual villain who had reasons, albeit mistaken, they use a character whose original appearance was of him killing himself and being a red herring. So it was a double whammy for Iron Man fans. Even if you were okay with a twist, they twisted with the wrong person for the wrong reason. A P.S. 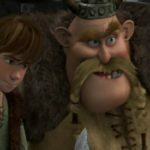 : Some of this column was inspired by another piece, this one at Cracked.com that noted the unintentional hypocrisy of How to Train Your Dragon‘s storyline. 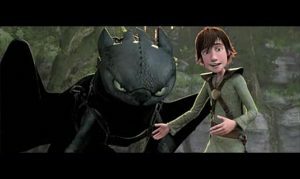 [T]he hero of the movie, Hiccup, is a nerdy kid who manages to trap a dragon and tame it. The dragon even lets him ride it around, and the rest of the movie is about Hiccup and his pet dragon trying to convince the rest of the village that humans and dragons don’t need to be at war. Dragons are people too! So how does Hiccup and his pet dragon eventually get this point across? By heroically murdering another dragon. However, if I recall right, Rebecca LuElla Miller first noted this inconsistency. Yes, I love How to Train Your Dragon, but must admit this is inconsistent. Someone could have at least made a brief, quickly-refuted effort to tame the monster dragon. But perhaps by visual-story-logic, this wouldn’t have worked ’cause it’s ugly.